We all know that French roulette offers the best house edge out of the three variants – including European and American – and if you didn’t, you do now. As such we want to know where we can locate a title at a secure online casino and exactly how that house edge is created, as well as where to play the title online. Why is French roulette so hard to find at the casino? The French variation of roulette is considered to be the ‘first’ of the roulettes, confirmed by the fact that roulette means ‘little wheel’ in French. Despite being the original it isn’t very popular with casinos as it is quite advantageous to the player and at the end of the day casinos are businesses that need to make a profit. Therefore, if they can offer roulette variants which are more favourable to the house then they are going to do so – hence the number of American and European roulette titles that are so easy to locate. American roulette has the highest house edge at 5.26%, thanks to the inclusion of a single zero and a double zero, as well as the numbers 1-36, on the wheel. While European roulette features just the single zero pocket along with 1-36. The single zero takes the house edge down to 2.7%. The French roulette variant has the same pockets as the European title, but it has a lower house edge. This is because of two extra rules known as the La Partage rule and the En Prison rule. La Partage: This rule sees players who place an even money wager receive half their bet back if the ball lands on zero. En prison: This rule sees players once again making an even money wager and if the ball lands on zero then your initial bet is ‘imprisoned’ for the next spin. If the initial wager wins on the second spin you are returned your entire bet, but without winnings. If it doesn’t win then you lose – but it basically gives you two shots, risk free. This brings the house edge down to 1.35% for French roulette, making it the most favourable variant for the player, but obviously not the house. This is why it can be so hard to locate. While there aren’t as many French variants available as their European and American counterparts, there are still more titles online than what you’d locate at land-based casinos. However, we recommend playing at these web casinos only as they adhere to strict guidelines from governing bodies such as advanced gaming jurisdictions and independent auditing companies. The French roulette wheel features 37 pockets, numbered from zero (coloured green) up to 36 (coloured red or black) – similarly to the European version. The one thing that is different is the table layout. The predominant difference here is the position of the Outside bets, including Low/High (Manque/Passe), Even/Odd (Pair/Unpair), Black/Red (Noir/Rouge) First Dozen (Premier douzaine), Second Dozen (Moyenne douzaine), and Third Dozen (Dernière douzaine) bets. Here, these bets are split into two and run along both sides, rather than one side as they do in American and European roulette table layouts, with each outside bet named after its French translation. Inside bets, including Straight up, Split, Line, Corner, and Six Line bets are in the same position as both the American and European variants. 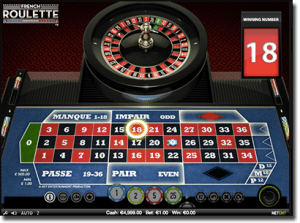 French roulette has the same gameplay premise as American and European versions in that players place a bet on the outcome of where the ball will land on the wheel. This is done simply by placing chip/s on specific areas on the table to determine the bet selection. Players can place one or more wagers at a time, provided they play the minimum amount per bet. The wheel is then spun and the outcome determined by what the ball lands on and players are paid out if they have won. As we mentioned above, there are additional rules, including the La Partage and the En Prison rules, but there are also other rules known as call bets only available for the French variants. Finales en Plein – players wager on numbers that end in the same digit, e.g on finales five en plain means wagering on 5, 15, 25, etc. For a range of instant-play roulette variants, we recommend checking out Raging Bull Casino, our top-rated casino site for players from United States, which has some excellent welcome bonuses available for new players.